The Ayers Rock, or Uluru as it is known today in the language of the traditional owners, is the symbol of Australia. It is a sacred place and visitors are discouraged to climb the rock to show respect, although it is not forbidden. Nice walks can be made around the base, where there are several ceremonial places. The Olgas, known as Katya Tutya, is a stunning range a bit further away from Uluru, which can be visited in a day from the small settlement at Uluru. Smaller in size but again a very powerful site, the Devil’s Marbles, or Karlu Karlu, is just off the main Darwin-Alice Springs highway. Camping is allowed in the area for a small fee (to be dropped in a locked box) and there are clean facilities. Even if you do not have your own transport, these places can be visited by coaches, they drop and pick up people at all important sites. The New Year has already started in Sydney with an extravagant fireworks display. If I’m right the Sydney fireworks craze has started with the 2000 Olympics – I certainly remember NYE celebrations without any fireworks – and since then it became the biggest party in the world, with an estimated 1.5 million revellers on the streets and a billion people tuning in to watch the show on the screen. “The best views will be had by those who queued for hours to take temporary possession of a prime piece of real estate at the Botanic Gardens, the Sydney Opera House and Circular Quay. Some splurged up to $500 for a Baywatch-themed cocktail party at the Opera Bar where guests were being served drinks by waiters in swimming costumes. I personally would prefer a quieter place – and Sydney offers several good choices – but don’t want to argue with Marc. Different strokes for different folks – enjoy it and a Happy New Year! I have been away from Sydney for quite a while, almost a decade. Today I started sorting my old images and I found these shots which I took with my first digital camera, a Ricoh, in year 2000. This was when I started taking pictures more consciously, although I do have a good number of pics made before the digital age kicked in. Time to time I will post some of the old images – not only from Australia but also from Asia, the Middle East, Africa, and of course Europe. Wherever it is relevant, there will be a story as well, at other times the pictures will talk for themselves. Sydney skyline with the Center Point tower in the background. Streetperformer in Darling Harbour – again, with the tower. Bicycle couriers in King Street, CBD – one playing a trumpet. Footprint of an emu in the pavement at Redfern. Footprint in the pavement at Redfern. After a 4-month break it was again time to go for a walkabout – first to one of my favorite locations, Paris, and then onto visiting friends in the UK. I’m staying in Portsmouth at the moment, but the plans don’t end here. Based mostly in Vienna these days, it won’t be difficult to revisit France, the UK, Italy, Spain or wherever I feel like to go – when I feel like to go. Sitting in the harbour of Old Portsmouth from where the “first” Australians sailed out. The area reminds me of the Rocks and Circular Quay, and the striking modern structure of the Spinnaker Tower behind is like the Opera House in a way. Still, it is a long way from Sydney… and not even that close to Edinburgh. France, however, is just across the water. · Portsmouth is mentioned in the Domesday Book of 1090 detailing Bocheland (Buckland), Copenore (Copnor) and Frodentone (Fratton). · In 1775 Captain Cook arrived in Portsmouth aboard the Endeavour after circumnavigating the world. · In 1787 Captain Bligh of the Bounty set sail from Portsmouth. · In 1787 the first fleet of transport taking convicts to Botany Bay left Portsmouth in HMS Sirius – and the following year set up the first colony in Australia. 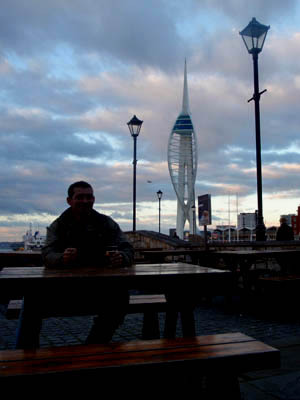 · Southsea beach and Portsmouth Harbour were military embarkation points for the D-Day landings on June 6, 1944.